Wander through the maze of Barnard Observatory, past multiple rows of dark wood bookcases, and begin at the base of the curved stairwell, not the main one, but the one off to the right. Climb two sets of pre-Civil War stair- wells and land in Jimmy Thomas’ office. Seriously, land in it—no door, no office number, no secretary answering a phone. Just look up and be greeted by a light-infused circular room and a soft, friendly smile from Thomas himself. 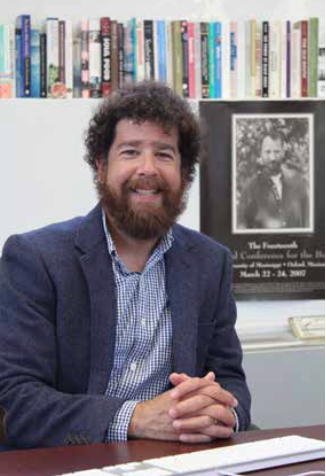 Thomas is the associate director for publications at the Center for the Study of Southern Culture, located in the east wing of Barnard Observatory on the University of Mississippi campus. Thomas has not only worked for the Center since 2003, but he also is an adjunct professor in the Department of Writing and Rhetoric. Thomas grew up in the Mississippi Delta, specifically Leland and Greenville, and graduated from UM with a bachelor’s degree in English and philosophy in 1994 and a master’s degree in Southern Studies in 2007. After finishing his master’s, Thomas began teaching Liberal Arts 102, which is an alternative to Writing 102 and is offered through the Department of Writing and Rhetoric. LIBA 102, a first-year seminar, is only available for freshmen students to take after they have completed a 101 writing course. Thomas said that the advantage of taking LIBA 102 instead of Writing 102 is that students would be taking a research writing course from an expert in that subject, whether it is Southern Studies or even engineering. Seckman said that Thomas is her favorite professor at UM. In Thomas’ research writing class, each student writes three research papers—two shorter papers and one eight- to 10-page paper. For the final project, students pick an iconic Southern person, place, thing or event and write about it. Getting the students to be engaged intellectually and to care about the subject that they are writing about is how Thomas said he influences his students’ greater understanding of writing. Thomas said that his favorite parts about teaching are getting to know the students and watching them improve their writing over the course of the semester.